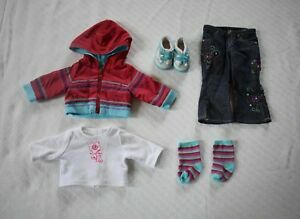 American Girl 18" Doll COCONUT FUN OUTFIT - Retired! ! momtofourkiddies has no other items for sale. American Girl NICKI’S TIE TOP AND SHORTS + SANDALS NIB retired NO doll LAST ONE! American Girl Truly Me 18" Doll MAG JLY29 Red Hair Green Eyes Freckles "Retired"
I will combine shipping on all auctions. You will be charged the true cost of shipping based on your zip code and the total weight of the package, plus a $1.00 service fee for each listing.